Baseball broadcasts on radio these days are not just about calling a game. Broadcasters have to sell products, keep up interest in the team, entertain guests and oh yeah, deliver a quality call so you, the listener know what is happening in the game. Things have changed from the old days of baseball play-by-play. It’s no longer a “straight forward” broadcast that deals with the game in front of them and really nothing else. Now broadcasters have to be up on all the news from around the league, their team and be up on all the new statistical information provided to them. Plus, they have to entertain an audience no matter what the score or how their team is doing in the standings. It’s not as easy as it may sound. Longtime Diamondback’s play-by-play man Greg Schulte, now in his 21st season behind the microphone agrees, these aren’t your father’s baseball broadcasts. Innovation is alive for some teams. 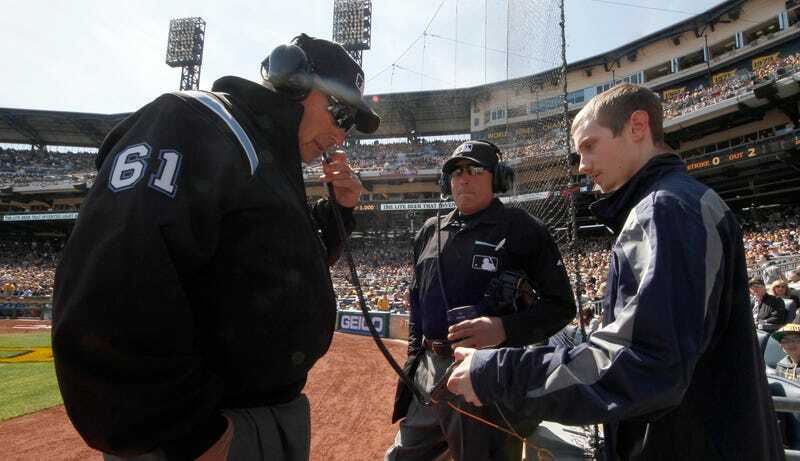 “Candy (partner Tom Candiotti) & I have gotten in to more discussions about current baseball happenings,” Schulte said. “We’re doing twitter polls on-air. Incorporated a Dbacks minute in place of a pair of half-inning commercial breaks. It’s a lot different listening to a radio game now, than it was when I was a kid growing up. “I loved using my imagination listening to Harry Caray & Jack Buck describe Cardinals baseball. I still love talking about the stadium, team uniforms, scoreboard, hot dog vendors, as I bring people inside the ballpark. Try and be as descriptive as I can each and every night.”, Schulte said. Ted Leitner who is calling his 40th year of Padres baseball (and my former partner in that booth) has a style that’s all his own. The beloved broadcaster shared a thought on how he likes to keep an audience entertained. The downside of trying to entertain is not everyone is doing a non-traditional broadcast. Leitner says, “Doing that can lead to criticism from fans and you’ll get the ‘just shut up and give the score’ comments from listeners. (It’s a) Matter of taste.” says the veteran broadcaster. I also wanted to know how broadcasters balance the game with everything else going on around. It is becoming a little more common for teams to put front office members, celebrities at the park, and draft picks on the air for a half inning or more. The problem is the guests don’t always understand that on radio every pitch needs to be called. I’ve had situations come up where a guest just won’t stop to let me get a call in. It’s frustrating but at the same time, it’s important to be a team player and allow for that possibility because the team wants that person or group on the air to promote something. Lastly, I was curious how each of these broadcasters handled replay reviews. Obviously listeners can’t see the play that is being challenged, so what do you do? Leitner’s approach is just slightly different. No matter the era, or changes to the game, no matter the changes in philosophy for what a broadcast should be, baseball is meant for the radio. There’s nothing better on a Summer afternoon or evening than sitting in your car or house hearing the crack of the bat, the murmur of the crowd, the vendor hawking his wares and a familiar voice. The Voices of Summer are on the case bringing you the National Pastime in its purist form, even if that art form has changed a little bit.